The game of darts originated as a pub game in the pubs of the United Kingdom before becoming popular in the rest of the world, especially America. In its earliest form, soldiers played darts by throwing truncated arrows at the bottom of casks or at the trunks of trees. Today, throwing darts has become a favourite past time amongst drinking mates. The game of darts is not only about of fun and games; it has a serious and competitive side to it as well. The British Darts Organization (BDO) and the Professional Darts Corporation (PDC) organize separate World Professional Championships during the Christmas/New Year period. Professional and amateur dart players from all around the world compete in the Championships. When pubs began to host the game of darts, solid wooden blocks were used as dartboards. These wooden blocks required a lot of maintenance and had to be immersed in water overnight to heal the marks created by darts. Eventually small bundles of sisal fibres that were similar in length began to be used in the construction of modern day dartboards. The next generation of dartboards is witnessing a move away from natural fibres to contemporary electronic boards. The Visual Assist Dartboard from quality online retailers, Hammacher Schlemmer, is a next generation, modern electronic dartboard that should appeal to the rookie and traditionalist alike. The Visual Assist Dartboard has a traditional circular shape to it with the various scoring sections highlighted in big, bold numbers. The difference lies in the electronic sensors that make up the body of the board. When a dart is thrown on to the board, the particular section on which the dart lands is illuminated. 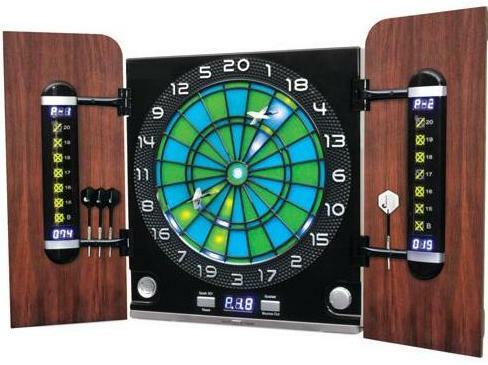 Two wooden boards are attached to each side of the circular electronic dartboard by black hinges. These wooden boards carry digital scoreboards for each player. Once a session is over, the darts can be placed on the wooden boards and the two partitions can be closed around the board. The electronic dartboard is high in intelligence and uses bright LEDs to suggest the fastest way to zero points. Apart from traditional variants of dart games, the board also includes innovative games such as Count Up, Blackjack, and Treasure Hunt where players get to uncover a secret treasure buried on the board. The Visual Assist Dartboard from Hammacher Schlemmer is a fun addition to have at your house while having friends over. It currently retails for $199.95 . If you believe in innovation, you must also read the article on Dart Coat Hooks or choose to play game using Touchscreen Chess Board.